Belle is every inch a beauty in haute couture. Tonal pieces and a subtle rose-inspired print add luxurious depth to her classic gold gown, while sculpted tassels and scarlet faux gems lend a memorable finish. This resin piece stands 20.0cm tall. Each piece is hand painted and slight colour variations are to be expected which makes each piece unique. Supplied in branded gift box. Not a toy or children's product. Intended for adults only. 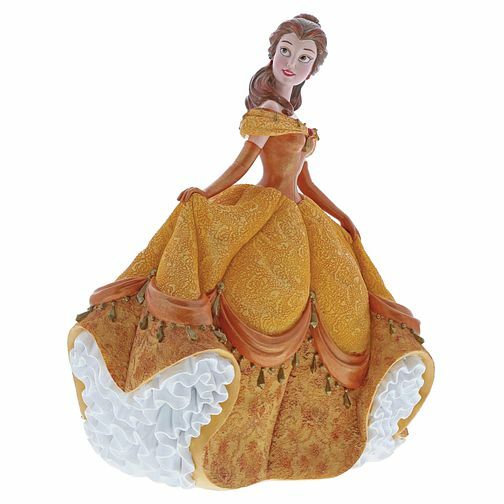 Disney Showcase Beauty And The Beast Belle Figurine is rated 5.0 out of 5 by 3. Rated 5 out of 5 by Anonymous from Stunning Addition Bought this to add to my Disney showcase collection, Belle is absolutely stunning and looks amazing next to the Beast. Rated 5 out of 5 by Anonymous from Better than expected! I purchased this item for my mom for christmas, as she has a large collection of Disney beauty and the beast. She saw this in store, and when I went the next week it had sold out so I purchased it online. It only took a few days for the item to be in store. Which I didn't expect being so close to Christmas. When I received a text to say it was in store, I went up the next day. When I went into the Wolverhampton store, I was approached by a gentleman, and he very politely asked if I needed help. He dealt with my order superbly and quickly but did not rush me. Overall it was a great experience in store.